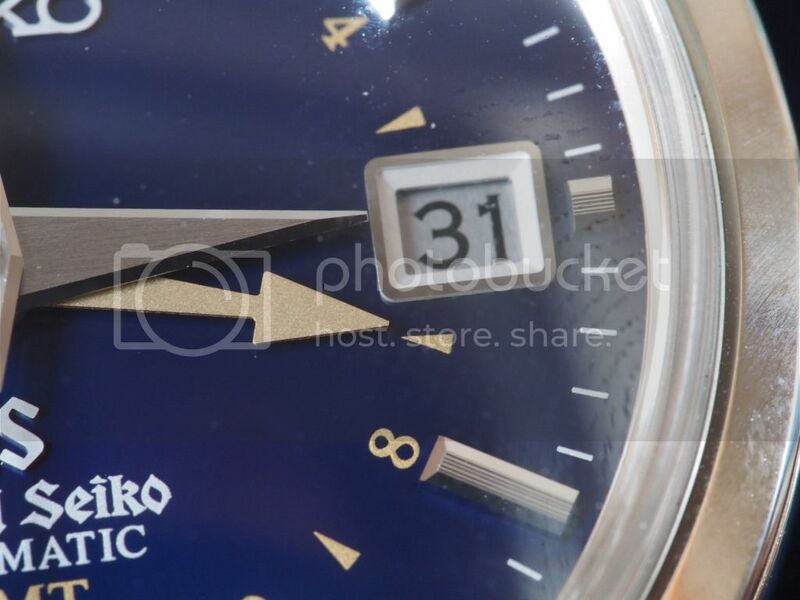 This watch (SBGM031) was announced at Basel in 2012, a limited edition (1000 worldwide) on the 10th anniversary of Seiko's first GMT watch in the Grand Seiko product range. It's not a huge watch, well, not huge by current watch fashion standards at 39.5mm across and about 14mm deep, but its smallish bezel gives it a surprising wrist presence. The 1960s vibe of some of the GS range is complemented by a "box" section sapphire crystal which resembles the domed acrylic crystals of the 60s. These are fairly expensive to produce, IWCs earlier DaVinci line were fitted with acrylic crystals with a sapphire option. 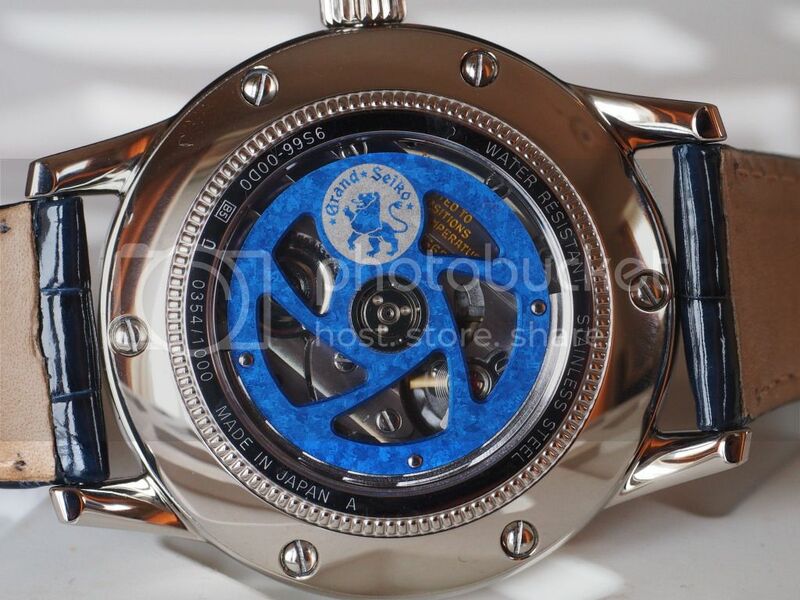 If I remember correctly the sapphire option added something like CHF1600 to the cost of the watch. To be fair the IWC crystal was more deeply dished and would probably have been more difficult to produce. 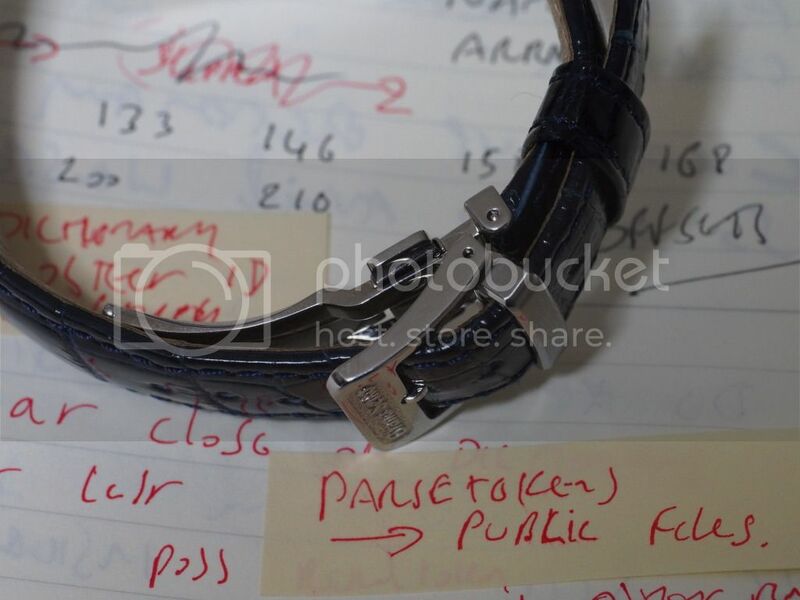 The clasp is a hybrid deployant/tang buckle which, as you can see below, is rather thick. 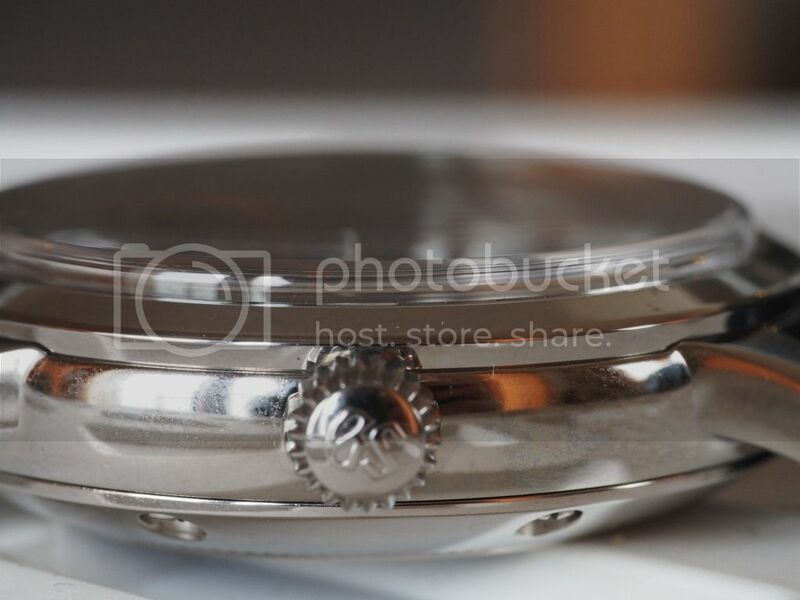 It's a wonderful buckle and will help prolong strap life but I have visions of a simple tang there in the near future. 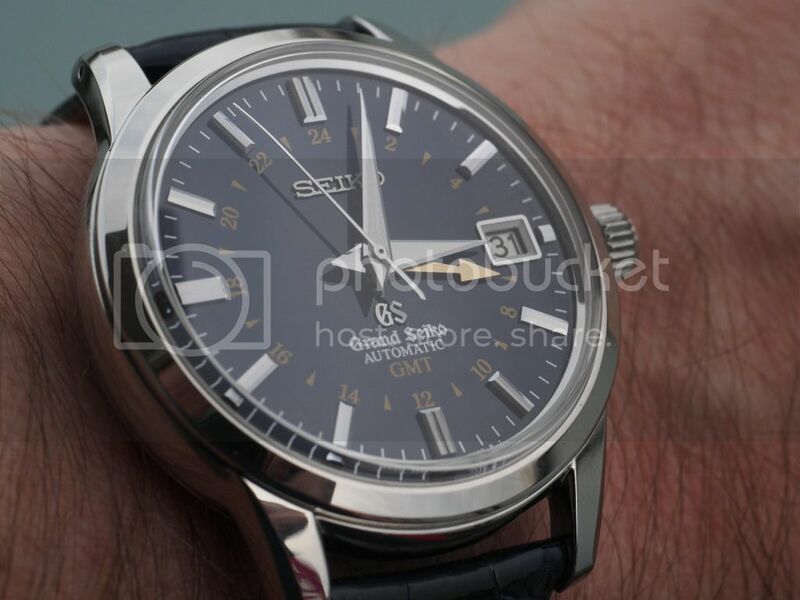 It's driven by a 9S66 movement, the second generation of the Grand Seiko GMT movement. This has a 72 hour power reserve (the previous version held 55 hours worth of rotor or finger twiddling) than the previous version, the jewel count has risen to 35 stones. The raw movement is 28.4mm in diameter and 5.9mm thick. There are a number of detail changes -- finishing, stiffening of some parts etc. -- but the biggest change is the MEMS process used for the escapement wheel and pallet fork. This is an obvious evolutionary step, we've run out of three letter acronyms and there's only one way to go. 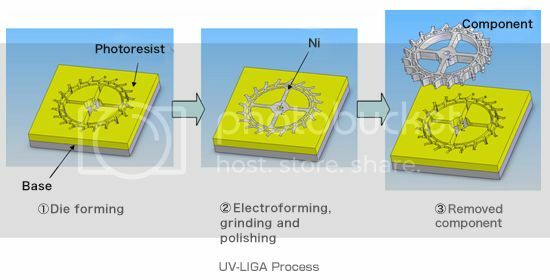 Micro Electro Mechanical System technology is a product of Seiko Instruments Inc. and uses a combination of UV lithography to create precision moulds and electroforming (deposition) to fill the things. SII's UV-LIGA process allows for the fabrication of complex shapes to very high tolerances. The biggest advantage for mechanical wristwatches is the surface finish - roughness is approximately one fifth of a similar traditionally produced surface. 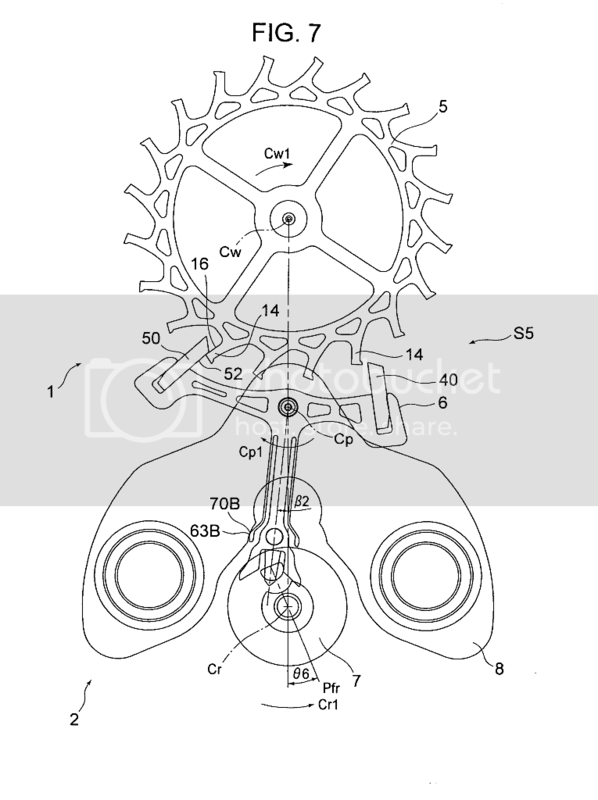 This has obvious benefits in an escapement where pallet stones slide across escape wheel surfaces alternately locking and delivering driving impulses. Best of all, making the things needs lots of high tech gadgets and beats bashing tins with a cookie cutter, that's progress. My Google-fu is insufficiently powerful to get detailed images of a MEMS escapement, photographing the thing through the display back is awkward and I'm not taking mine to bits (yet) so you'll have to make do with a line drawing from US patent application number 13/373,369. The movement is a true GMT movement (well, almost, mine is set to BST but that's close enough), the 24 hour hand and minutes hand are linked and these are used to set the base time. The 12 hour hand moves independently and can be stepped forwards or backwards in one hour increments. The date is bidirectional so there are no worries. Bringing the watch to time means setting the base time with the 24 hour hand and minutes hand then bringing the hour hand to the required local or remote time. The date isn't quick-set but I think it can be set by getting the 12 hour hand to swing around midnight. The rotor is unusual, it's an anodised titanium plate with a tungsten weight riveted to part of its periphery. Anodised titanium doesn't need any dye like, for example, aluminium to give it a colour. Its colour depends on the thickness of the anodised layer and is generated by interference between reflected light waves - some wavelengths are reflected by the anodised surface and some by by the titanium substrate. The titanium also appears to have been etched to show its crystalline structure, this looks fairly dull on untreated parts but looks wonderful on anodised parts. Every silver lining has a cloud, the full plate rotor makes taking photos of the innards awkward. Yes, there are a number of different typefaces on the dial. To criticise the design for this is, I believe, indicative of a lack of understanding of Japanese typography. Japanese is, perhaps, unique in that it has three families of characters as opposed to the single family common in other cultures. The main family is Kanji, characters derived from Chinese. These are pictographic characters that can be fiendishly difficult to write and because they are pictographic there are lots of them, thousands of the things. There are two phonetic character families, these are useful for a great number of reasons. Because they are phonetic there are not so many of them. They are simple so very young children can read them, when new words arrive in the language creating a new pictographic character is a non starter for very obvious reasons, new words get the phonetic character set treatment. Phonetic characters come in two styles, hiragana and katakana. The former is a set of cursive characters and is used for new Japanese words and for phonetic versions of kanji and the latter is a more linear style used for foreign loan words, company names and the like. Many public notices have small hiragana versions of complex kanji written above the main text, this means that children who haven't yet learned more complex characters can still read notices and direction signs. Station names are listed in kanji, hiragana and (very frequently) English. Japanese typography starts as a mish mash of styles - kanji for advanced readers, hiragana for youngsters (and Johnny foreigner), katakana for foreign words... Hey, there's logic here - character style groups. So, Seiko - company logo, company logo typeface. 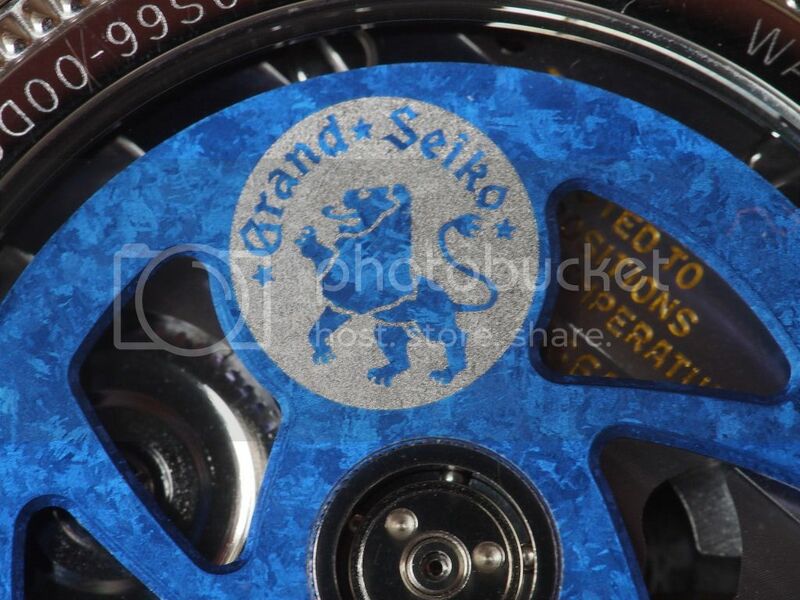 Grand Seiko, sub brand logo, different typeface (these two should get a free pass anyway since they are product logos), the GMT stuff - hey, that's all the same style. The date numerals - different logical group. The hands, markers, case shape and other watch-centric elements all come from a simple background and good design has universal appeal. Typography, that's much more complex and the typography landscape in Japan is more complex than most, what works here may not have universal appeal. Japanese typography can be very beautiful but in real life, in settings where its prime function is to convey information, it can look messy to eyes more used to a single family of characters. Years ago when I was with IBM I worked on my own small product. As release time neared I handed the resource files -- files that define how the user interface looks -- over to the translation folks. The Japanese versions came back, I built the localised version and... it looked completely different. The logical groupings of elements were the same but the shapes, the positioning of text and a number of other things just jarred with my original design, I'd designed and coded the thing and had to think hard when using it! My design was used for international markets, the locally themed design for the Japanese market. Different aesthetics. Accuracy, yeah, right. It's mechanical watch. I haven't delved into the accuracy sutra of a different position every night and I haven't set up a little shrine with effigies of Pierre Curie, Paul Langevin, Warren Marrison, Juergen Staudte and others to stick pins into. As long as I don't miss trains I'm happy. The "don't miss trains" requirement is pretty stringent, long distance services here leave pretty much on time and I use my watch to choose between a slightly better cup of coffee on the way to the train or not so good one on the train. With an eye on the future, one of the nice things about living here is service, there's a Seiko service centre twenty five minutes from home. One of my 9F watches developed a problem recently - off to the service centre, they had a poke about inside it and said two weeks, 5000 yen. Two weeks later they phoned to say that it was ready and the service cost was 5000 yen (including new battery, seals and testing). The dial is a beautiful shade of blue, it hasn't got the fabulous inky depth of some of the black Grand Seiko dials but it's not far off. 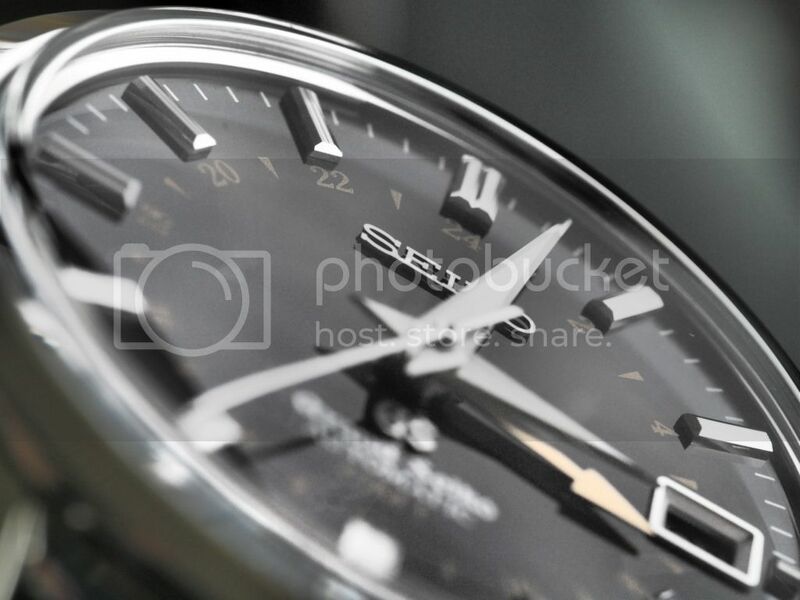 The black Grand Seiko dial is a tough act to beat. The evenness of the surface is wonderful and these photos come nowhere near capturing it.